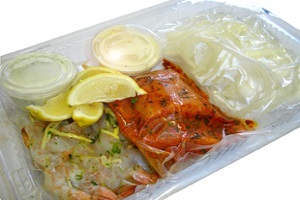 You can cook up a storm with our delicious fresh seafood BBQ package. Includes tandoori barramundi fillet and marinated prawn skewers. Served with sauces, condiments and sliced onions. (Minimum order 10 people). Please note that our BBQ package price is per person and requires 1 weeks notice. E-mail us the details of your event at catering@aboutlife.com.au or give us a call on 8755 1311.